*John Tuttle, from ‘Of Interest and Intellect’ is here today to introduce us to the marvellous Churches of Rome. Words and photography are subject to copyright and remain property of John Tuttle. Rome, Italy has held a significant place in history and culture for millennia. Like many ancient civilizations, this original capital of the Roman Empire was situated by a great river, the Tiber. I was fortunate enough to visit this city last year in the months of September and October. 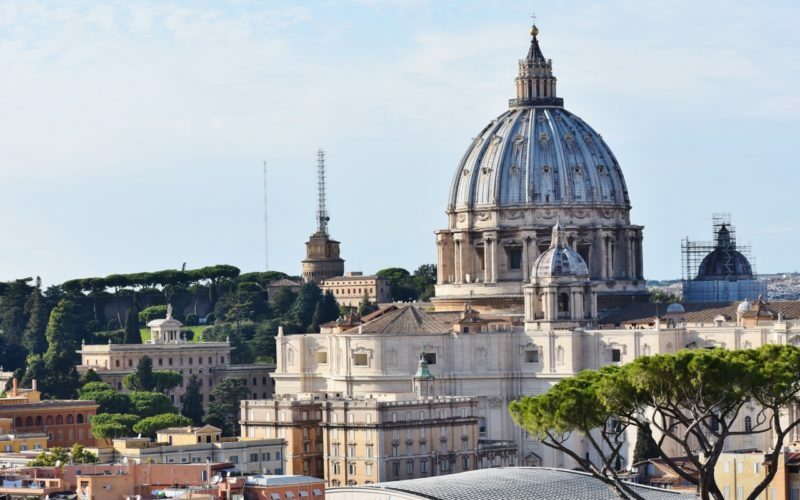 Renting an apartment in the Trastevere quadrant of Rome, my family and I were able to walk to the Basilica di San Crisogono, one of the many local Catholic Churches of Rome. The walk was about five minutes or so from our front door. It turned out that in the parish we usually attended morning Mass at there was kept the body of a woman who has received the title of “Blessed” by the Church. She is Anna Maria Taigi, and my family has had one of her documented relics for a number of years. After learning this, we were astonished to some degree. We had no idea her remains were venerated in a church just a block or two from our apartment building, and many of us did not think it was a coincidence. Rome is renowned for it markets, pubs, cafes, and fine dining restaurants. The expansive cathedrals, obscure chapels, and beautiful basilicas are just as plentiful here as the many culinary establishments. The pizzerias provide food for the stomach. And the churches provide food for the soul. No doubt the Eternal City is famous for its rich culture, architecture, and art. Nothing shows these aspects better than the churches. Statues, carvings, paintings, mosaics, icons, and symbols can all be found within and without the walls of every church. Some of the world’s most grandeur-filled places of worship are placed here. It is the very heart of Christendom, and it’s not difficult to see it. By simply walking the cobblestone streets for a few minutes you are almost guaranteed to see a priest or nun. The Religious are not a rarity. In fact, the true reason our family took a two-week excursion to Rome was to support my cousin at his diaconate. A seminarian at the North American College, he made the required set of vows to become a deacon. The ceremony was held in St. Peter’s Basilica in the Vatican, and it was a crowded and cheerful occasion. St. Peter’s is a massive church, the full extent of which is hard to grasp even when standing beneath its dome. There are literally dozens of altars lining the interior perimeter, each more stunning than the last. Lofty three-dimensional figures provide an added otherworldly aesthetic. Many tourists and pilgrims visit these sites not realizing that the various artistic forms are meant to raise the mind to thoughts of the Divine. No matter what your beliefs are, you can’t argue that some of the art in the churches is just breathtaking. Though we visited many churches of Rome, a few of the highlighted basilicas we visited were St. John Lateran and St. Paul Outside the Walls. Inside the main church of Paul Outside the Walls are many pillars, statues of saints, and images of past popes. We visited the Trevi Fount and the Colosseum. Later on the same day we went to the Colosseum, we walked to the Pantheon. The Pantheon, like the Colosseum, has been severely damaged in time and has undergone much construction. A Roman temple in ancient times, the Pantheon was eventually converted into a church. This is one of the sites which attracts vast numbers of tourists. One of the fondest experiences in Rome was having the privilege to serve on the altar in the Basilica of the Holy Cross in Jerusalem. (My brother and I are altar servers at several churches in Rockford, Illinois.) At that Mass, my cousin gave his first homily as a deacon. It is the Church in which several thorns, nails, and fragments of the Cross from Christ’s crucifixion are held. It was amazing to be able to visit it. I really enjoyed my stay in Rome. If I have a chance to return there in the future, I’m pretty sure I would go. John Tuttle is a young and energetic man with a passion for travel, art, and his Catholic faith. He is a travel writer and photographer who has been published on Travel Tamed, No Path Travelers, Travellers Point, and elsewhere. His photography has been published on Ancient History Encyclopedia, Blue Marble Review, The Manhattanville Review, and Formercactus. He also runs his own personal blog Of Intellect and Interest. He can be reached at jptuttleb9@gmail.com. If you are staying in Rome and looking for the perfect day trip, I recommend a day trip to Tivoli from Rome. and Rome in a Day. If you have in interest in Churches, you might also like to read about 10 lesser known Churches of Rome or the Fortified Churches of Romania.